Tomorrow I will post progress on "Spoolin' Around," my selvage-edge challenge quilt. So excited. It has turned out even better than I expected! But for today, it is kind of dreary outside so I thought pictures of colorful fabric might be cheerful. The top two are Patricia Bravo's yummy new solids and Nature Elements (LOTS of gorgeous colors) , and the bottom is from Laura Gunn's new line. Thank you, Hawthorne Threads, for your super speedy service! ...when I saw this picture. The one on the right. 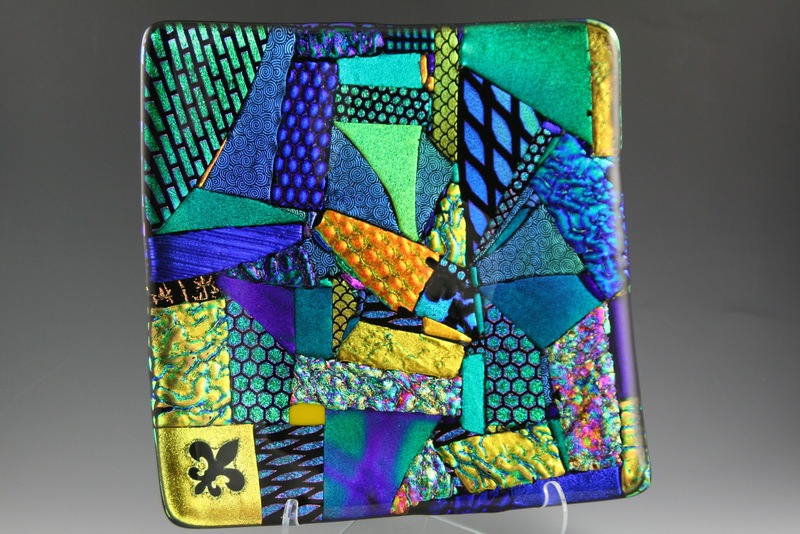 Alex Anderson has been a huge supporter of Mark's fused glass business, Around the Block Designs. 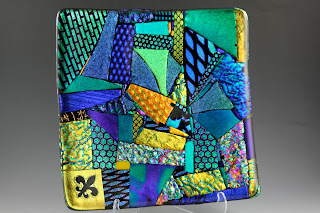 He has designed and made the plaques that The Quilt Show presents to their chosen Quilter of the Year each year, and Alex has purchased quite a few things over the years. Anyway, I just wasn't expecting to see it in the magazine and it was quite exciting. I'll be back tomorrow. Hope all of you experiencing Snowmageddon are getting a lot of quilting done! Love the fabric and the beautiful plates! Did your husband make them? Love your newest fabrics! I think Pat Bravo's collections of solids and blenders are so perfect with just about everything. Can't wait to see an update on your spool quilt. Congrats to Mark on his success! That is so exciting to see his gorgeous plates in that magazine. What a thrill to have Alex Anderson support his creativity. He does make gorgeous things. Yes, Snowmageddon is hitting us, so we are hunkering down. Love that fabric... i wanna get some of the lace elements one from Pat Bravo too... looks great doesn't it!! When I was buying some magazines to read on the plane the other day, I saw your selvage pincushions on the IQF cover here in Alabama and I wanted to say "I know who made these!" The plates are just stunning. I love the vibrant rich colors.